Today I have this cute little triangular treat box to share. 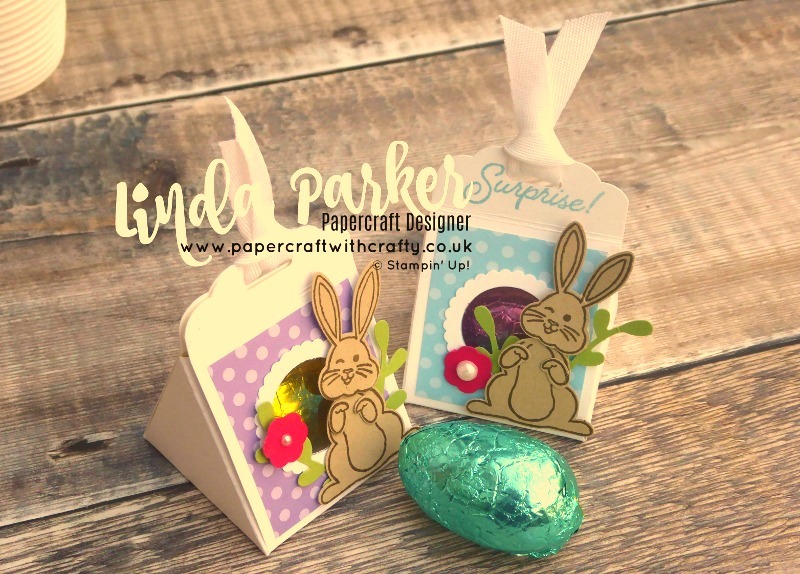 I have given mine an Easter theme as Easter is one of the next big celebrations of the calendar year and I like to be well prepared and share my ideas well in advance. 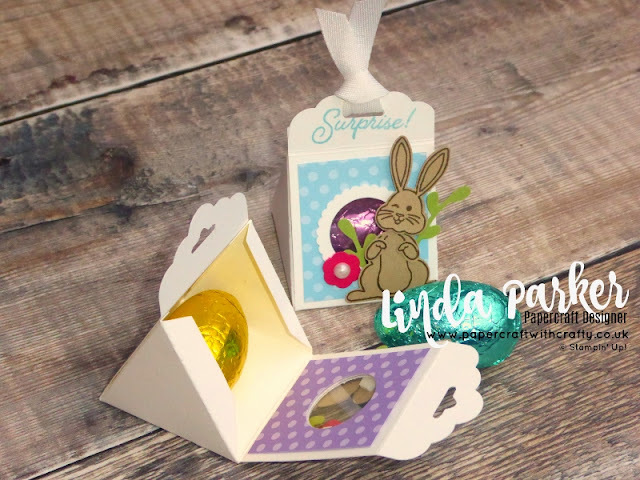 For my little treat box I have used the Best Bunny Bundle which is brilliant value for money at £28.75 for both the stamp set and the Bunny Builder Punch. This Bundle, although perfect for Easter celebrations, is also perfect for baby cards/showers and children's projects. My little treat box also used an assortment of other useful punches, including the Scallop Tag Topper Punch. That adds a pretty decorative element, but of course, you don't have to use one...... you could just round off the corners of the treat box if you wished to. I added a little piece of acetate and created a window for my treat box using circle punches. Again, this is optional...... you don't have to add a window if you don't want to. You could just decorate the front panel to suit. Any papercrafter will tell you how handy punches are, but circular punches that punch circles which can be layered in many combinations, are such a great way to build up a useful crafting stash and are a good investment. You can create windows for your smaller projects or just really cool layering toppers and tags. Hope you like it, thanks for looking and I hope you will pop back. Cute box! Must try it today. Thanks for sharing--your videos are so easy to follow. Is there a way to print the page with the project? That way my wife can follow the instructions without watching the video over and over. She had a stroke and I'm hoping she can do her projects again. She has a room full of stamps etc.